Heading into St. Patrick's Day weekend, when everyone is Irish for a day, investors may be interested in companies headquartered on the Emerald Isle. According to the National Retail Federation, American consumers will spend an average of $40.18 per person this year celebrating Ireland's favorite holiday. While the bulk of the total $5.61 billion will be spent on food and drinks, 30% of those surveyed said they will purchase green clothing so as to avoid being pinched. Warning! GuruFocus has detected 2 Warning Signs with SAL. Click here to check it out. 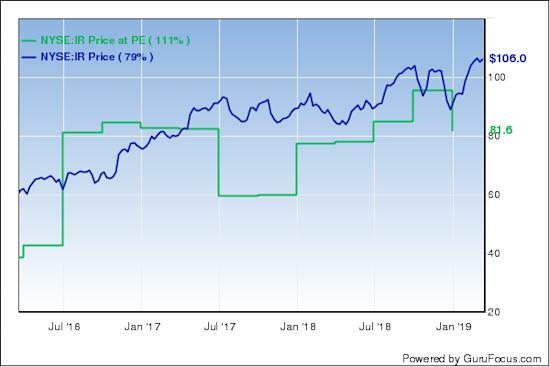 The GuruFocus All-in-One Screener found some Irish companies with strong business predictability ratings as of March 15 included Eaton Corp. PLC (ETN), Ingersoll-Rand PLC (IR), Medtronic PLC (MDT) and Ryanair Holdings PLC (RYAAY). 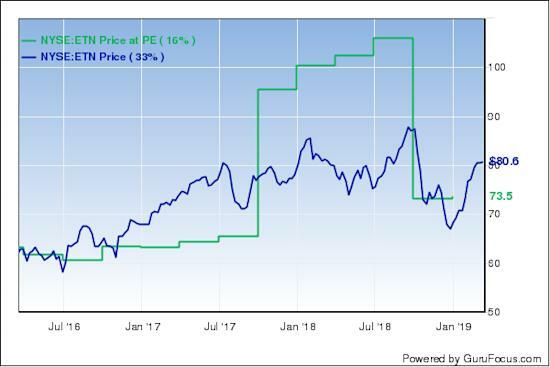 The Dublin-based multinational power management company has a $34.24 billion market cap; its shares were trading around $80.82 on Friday with a price-earnings ratio of 16.49, a price-book ratio of 2.17 and a price-sales ratio of 1.64. 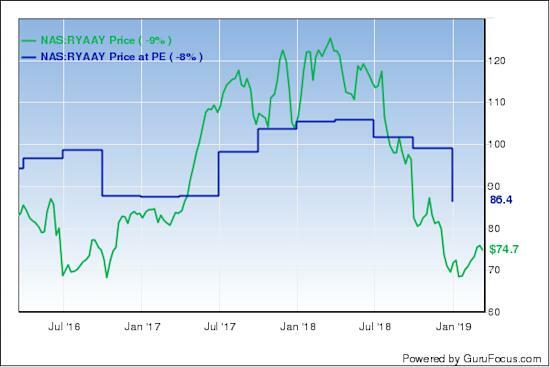 The Peter Lynch chart shows the stock is trading above its fair value, suggesting it is slightly overpriced. GuruFocus rated Eaton's financial strength 5 out of 10, boosted by adequate interest coverage. The Altman Z-Score of 2.82, however, indicates the company is under some minor financial pressure. The company's profitability and growth fared better, scoring a 7 out of 10 rating. 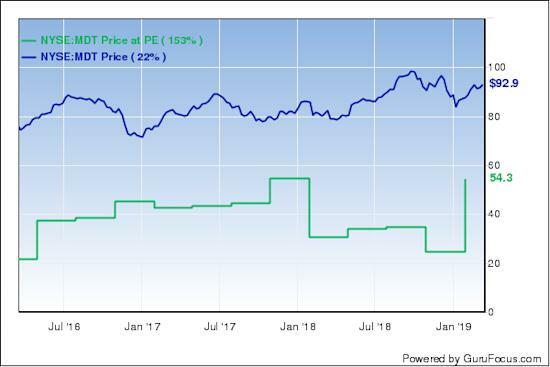 Eaton is supported by an expanding operating margin, strong returns that outperform competitors, consistent earnings and revenue growth and a moderate Piotroski F-Score of 6, which suggests business conditions are stable. The company also has a business predictability rank of two out of five stars. According to GuruFocus, companies with this rank typically see their stocks gain an average of 6% per year. Of the gurus invested in Eaton, Hotchkis & Wiley has the largest position with 0.25% of outstanding shares. Other guru shareholders include Pioneer Investments (Trades, Portfolio), Chris Davis (Trades, Portfolio), Joel Greenblatt (Trades, Portfolio), Jim Simons' (Trades, Portfolio) Renaissance Technologies, Jeremy Grantham (Trades, Portfolio), NWQ Managers (Trades, Portfolio), John Buckingham (Trades, Portfolio), Ray Dalio (Trades, Portfolio), Robert Olstein (Trades, Portfolio) and Caxton Associates (Trades, Portfolio). The Irish-American industrial manufacturing company, which makes everything from tools and parts to air compressors and ARO fluid products, has a market cap of $25.68 billion; its shares were trading around $106.05 on Friday with a price-earnings ratio of 19.79, a price-book ratio of 3.66 and a price-sales ratio of 1.70. According to the Peter Lynch chart, the stock is overvalued. Supported by sufficient interest coverage and a robust Altman Z-Score of 3.48, Ingersoll-Rand's financial strength was rated 6 out of 10 by GuruFocus. The company's profitability and growth scored a 7 out of 10 rating, driven by an expanding operating margin, strong returns that outperform industry peers and a moderate Piotroski F-Score of 6. The company also has a one-star business predictability rank. GuruFocus says companies with this rank typically see their stocks gain an average of 1.1% per year. With 1.42% of outstanding shares, Generation Investment Management is the company's largest guru shareholder. Pioneer, Simons' firm, NWQ, Greenblatt, Grantham, the Signature Select Canadian Fund (Trades, Portfolio), Ken Fisher (Trades, Portfolio), Paul Tudor Jones (Trades, Portfolio), Jeff Auxier (Trades, Portfolio), Mario Gabelli (Trades, Portfolio) and First Pacific Advisors (Trades, Portfolio) also own the stock. The Irish medical device manufacturer has a $125.6 billion market cap; its shares were trading around $93.65 on Friday with a price-earnings ratio of 25.87, a price-book ratio of 2.53 and a price-sales ratio of 4.18. Based on the Peter Lynch chart, the stock appears to be overvalued. GuruFocus rated Medtronic's financial strength 6 out of 10. Although the company has recorded a slowdown in revenue per share growth over the last 12 months, it still has sufficient interest coverage. In addition, the Altman Z-Score of 3.10 suggests the company is in good fiscal health. The company's profitability and growth scored a 9 out of 10 rating. While the operating margin is in decline, it still outperforms 88% of competitors. Medtronic is also supported by strong returns, a high Piotroski F-Score of 8, which indicates operations are healthy, and a perfect five-star business predictability rank. GuruFocus says companies with this coveted rank typically see their stocks gain an average of 12.1% per year. Investment firm Barrow, Hanley, Mewhinney & Strauss is the company's largest guru shareholder with 0.89% of outstanding shares. Other top guru investors include the Vanguard Health Care Fund (Trades, Portfolio), Pioneer, PRIMECAP Management (Trades, Portfolio), Dodge & Cox, Diamond Hill Capital (Trades, Portfolio), Grantham, Bill Nygren (Trades, Portfolio), Mairs and Power (Trades, Portfolio), the T Rowe Price Equity Income Fund (Trades, Portfolio), Hotchkis & Wiley, Steven Cohen (Trades, Portfolio), David Carlson (Trades, Portfolio) and many more. The Dublin-based low-cost airline has a market cap of $16.02 billion; its shares were trading around $75.53 on Friday with a price-earnings ratio of 13.20, a price-book ratio of 2.96 and a price-sales ratio of 1.94. The Peter Lynch chart suggests the stock is undervalued. Ryanair's financial strength was rated 6 out of 10 by GuruFocus. While the company has adequate interest coverage, the Altman Z-Score of 2.68 indicates it is under some financial pressure. The company's profitability and growth scored an 8 out of 10 rating, driven by operating margin expansion, strong returns that outperform industry peers and a moderate Piotroski F-Score of 6. Despite recording consistent earnings and revenue growth, Ryanair's three-star business predictability rank is on watch. According to GuruFocus, companies with this rank typically see their stocks gain an average of 8.2% per year. With 3.14% of outstanding shares, David Herro (Trades, Portfolio) is the company's largest guru shareholder. Simons' firm, PRIMECAP, Sarah Ketterer (Trades, Portfolio), Julian Robertson (Trades, Portfolio), First Pacific, Ron Baron (Trades, Portfolio), Pioneer and Francis Chou (Trades, Portfolio) also have positions in the stock. How Many ARMOUR Residential REIT, Inc. (NYSE:ARR) Shares Have Insiders Sold, In The Last Year? Who Has Been Selling IMPACT Silver Corp. (CVE:IPT) Shares? Should You Take Comfort From Insider Transactions At Lithium Americas Corp. (TSE:LAC)?